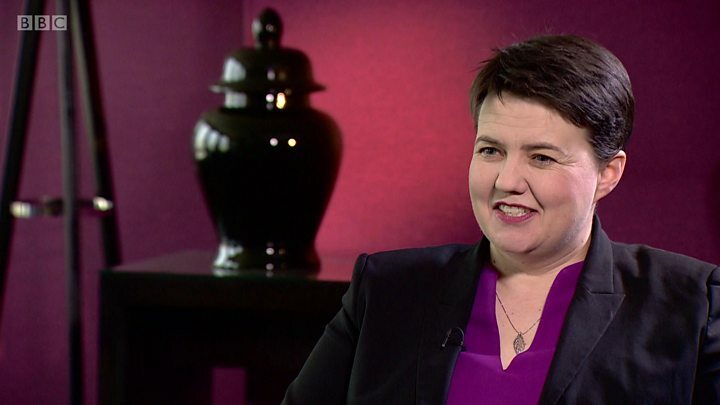 Scottish Tory leader Ruth Davidson has said she never wants to be prime minister because she values her "mental health too much". In an interview with the Sunday Times Magazine, she revealed her battle with self-harm, suicidal thoughts and depression as a teenager.The MSP, who is expecting her first child, also ruled out a peerage or becoming an MP at Westminster.She said the idea of leaving her child in Edinburgh was "actually offensive".Ms Davidson announced she and her partner Jen Wilson were expecting a baby in April, after undergoing IVF treatment. She is expected to give birth in October, and has announced her plans to take four or five months of maternity leave. Ruling out taking the helm at Downing Street, the 39-year-old, who is releasing her memoirs in the paper, said: "You have to want it, and I don't want to be prime minister".In 2016, while David Cameron was PM, she described the role as "the loneliest job in the world". Speaking frankly about her teenage years, Ms Davidson said her mental heath suffered after a boy from her village took his own life when she was 17 years old. "I went into a total tailspin", she said.She said she started hurting herself, "punching walls... drinking far, far, too much and becoming belligerent and angry".She was diagnosed with clinical depression a year later, but said the medication meant she had "dark, terrible dreams" and "couldn't tell what was real". In her second year studying English at Edinburgh University, she became so afraid of sleep she said she spent a whole term living nocturnally. She said her depression "was like a smothering black blanket over my head, cutting out the sky". "It was heavy, constricting, suffocating. It took away hope and energy and life. "The MSP said she combated her mental health issues by exercising regularly, moderating her alcohol intake, going back to church, and "most importantly to me, I threw away my pills".But she said she was still "frightened of going back to the psychological place [she] once inhabited". "When I have a period of heightened anxiety, or I can feel the weight of the black blanket start to descend, I go back to what I know works for me: structure, exercise, forward momentum, measurable outcomes. Sometime's that's hard in a job that's 100 miles an hour."